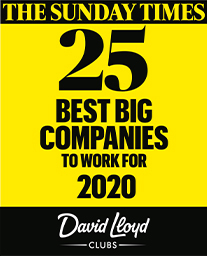 Fancy working for one of the Sunday Times 25 Best Big Companies ? We’re passionate about Health and Fitness and making a difference to our members. And we’re looking for a superstar to lead our Health and Fitness team. You’ll be leading your team to deliver all activities that take place in the gym and studios within your Club and giving members an exceptional experience every day. You’ll recruit the very best trainers with bags of passion, energy and enthusiasm and develop them to make a real difference to the lives of our members. You’ll deliver stunning commercial results by driving Personal Training revenue to exceed budgets through coaching and inspiring your team of trainers to deliver great sessions and loads of activity to exceed their targets. You’ll drive Group Exercise participation through managing your Group Exercise and Blaze Co-ordinator to deliver great innovative classes that the members want. You’ll walk your Fitness area and Studios daily to deliver 5 star standards of facilities through an obsessive attention to detail. You’ll make sure your team welcome every new member into the Club and they receive a personalised introduction to the health and fitness area, so that every member feels at home in their Club. You’ll adopt a commercial approach to running the Health and Fitness part of the business, continually looking into premium new ways to generate additional profit. So what are you waiting for - Apply today as we would love to hear from you. Our people make us who we are. On a day to day basis you will find yourself working in a state-of-the-art environment surrounded by friendly and passionate colleagues. Your work will be challenging and fast-paced but it will also be enjoyable, as working for us is about having fun. Visit the Why Work for us page for more information.